The FSD-504HP is a 4-port 10/100Mbps 802.3at/af Power over Ethernet + 1-port Fast Ethernet Switch with a total PoE budget of 60 watts, which is an ideal solution to meeting the demand for sufficient PoE power for network applications. 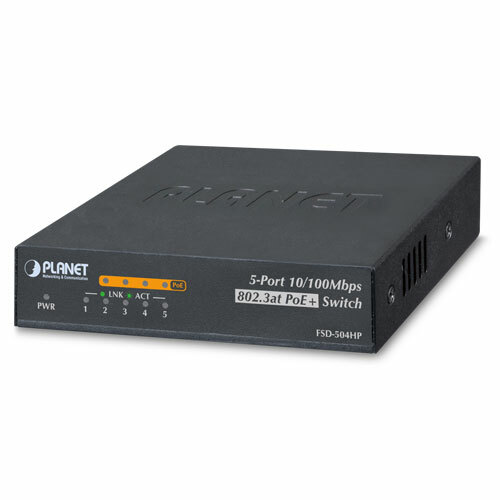 The four 802.3at / af PoE ports provide PoE power injector function which is able to drive 2 IEEE 802.3at compliant powered devices or 4 IEEE 802.3af compliant powered devices. The FSD-504HP also provides a simple, cost-effective and non-blocking wire-speed performance. It comes with a compact palm size metal housing, suitable for the desktop deployment of SOHO or home-use network environment. Targeting the growing popular IP surveillance applications, the FSD-504HP 802.3at / af PoE Switch is also positioned as a Surveillance Switch for quick and easy PoE IP camera deployment with power feeding. The FSD-504HP supports both 802.3at and 802.3af PoE standards along with 4 10/100Base-TX ports featuring up to 30 watts per RJ-45 copper interface, and 1 extra Fast Ethernet TP interface supporting high speed transmission of surveillance images and videos. With data switching and power over Ethernet integrated into one unit, the FSD-504HP reduces cabling requirements and eliminates the need for dedicated electrical outlets on the wall, ceiling or any unreachable place. A wire that carries both data and power can lower the installation costs, simplify the installation effort and eliminate the need for electricians or extension cords. With 4 PoE interfaces, the FSD-504HP is ideal for small businesses and workgroups making the deployment of the PoE facility including wireless access points, IP-based surveillance camera and IP phones in any places easier, more efficient and more cost-effective. With its expanded home-use feature, the FSD-504HP 802.3at / af PoE Switch helps SOHO / home users to create an integrated data, video, and powered network. The wireless AP and PoE IP camera devices work perfectly with the FSD-504HP, which injects power through the Ethernet cables, thus helping SOHO / home users to build a cost-effective and reliable PoE Networking environment easily. 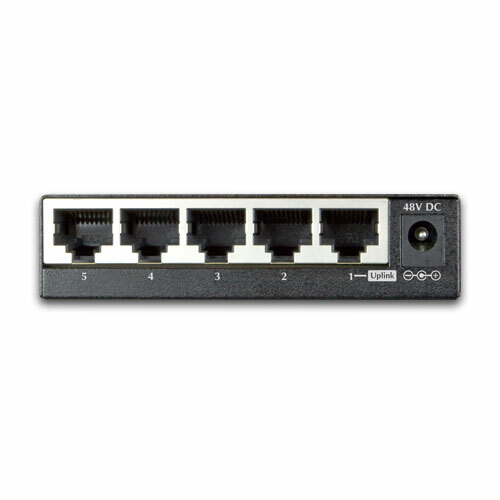 The FSD-504HP provides four 802.3at / af PoE ports for catering to small-scale home and SOHO IP surveillance networks at a lower total cost. The FSD-504HP comes with a high performance switch architecture and 60-watt PoE power budget. 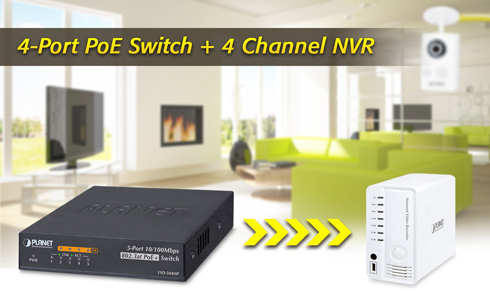 The recorded video files from the 4 PoE IP cameras can be powered by the FSD-504HP and saved in the 4-channel NVR system or using surveillance software to perform comprehensive security monitoring. For instance, one FSD-504HP can be combined with one 4-channel NVR; that is, each of its PoE port can be linked to a specific 802.3af PoE IP camera for the administrators to centrally and efficiently manage the surveillance system in one site. The FSD-504HP’s Fast Ethernet TP interface also provides Fast Ethernet TP connection for uplink to NVR systems or public server groups. With the business office expansion, the additional telephones required could be installed in less cost via the implementation of PoE IP Telephony system than that of the traditional circuit wiring telephony system. The FSD-504HP 802.3at / af PoE Switch helps enterprises to create an integrated data, voice, and powered network. The IEEE 802.3af compliant IP phones can be installed without the need of an additional power cable because the power can be provided via the standard Ethernet cable from the connected FSD-504HP. The wireless AP group, PoE IP phones and analog telephony adapter work perfectly with the FSD-504HP, which injects power through the Ethernet cables. With the FSD-504HP, IP telephony deployment becomes more reliable and cost effective, thus helping enterprises save tremendous cost when upgrading from the traditional telephony system to IP telephony communications infrastructure. Power Requirements DC 56V, 1.5A. 2014-04-18 1.1 Change 48V DC to 56V DC.